Batman to battle through minds of his enemies in Arkham Dreams! I don't like most cross overs. They are normally money grabs but every so often one shows that promises to do something with characters that has never been done before. That is feeling I get with this cross over between IDW and DC. 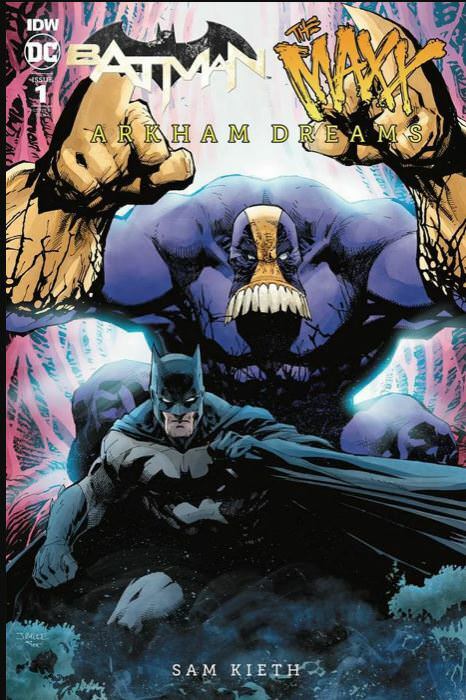 Arkham dreams promises to have Batman face off against Maxx a character many comic fans remember for his strong run in the 90s. Maxx is going to be used here in an interesting way. Maxx can use the mind landscape or outback and merge them with reality. That power is going to be used here to enter into the minds of many of Batman's most notorious villains. With all the fun psychoanalysis of Batman's villains this is a way to take that element of Batman up it up a notch. He will no longer just be analyzing these foes as a detective but litterally entering into the world of their derangement. It is also cool to see Max creator Sam Kieth on this project and his work is well suited for it as well. Batman must face the strangest and most bizarre adventure of his career, as he meets comics’ strangest and most bizarre hero… THE MAXX! IDW and DC Comics proudly present the most surreal, quirky, and wonderful crossover of all time! A devious new doctor at Arkham Asylum is conducting unconventional experiments into the human psyche, and he kicks off a chain reaction of disaster when he experiments on Arkham’s newest patient, The Maxx! The city of Gotham is starting to merge with The Maxx’s psychedelic mental landscape, known as the Outback, blurring the line between real and unreal. It’s up to Batman to save not just Gotham, but all of reality, and he and The Maxx are going to have to travel through some of the darkest places imaginable—the twisted minds of Batman’s greatest enemies! Join Batman and The Maxx on an off-kilter and unforgettable romp through the diabolical consciousnesses of Batman’s greatest foes. Legendary artist Sam Kieth (Sandman, Wolverine) returns to his greatest creation, The Maxx, and returns to Gotham as well, assisted by multi-Eisner Award-winning writer John Layman (Detective, Chew).